Ready to have a “bang up” cookout to celebrate the 4th of July? Longhorn Steakhouse is here to help! In honor of National Grill Month, The LongHorn Grill Us Hotline will be open Thursday, July 3, through Sunday, July 6, from 2 p.m. to 7 p.m. EDT daily. The restaurant’s Certified Grill Masters will be on hand to answer those burning questions to help take the heat off cookout preparation this holiday weekend. From choosing the best cut of fresh steak to achieving the correct grill temperature and using proper handling and seasoning techniques, LongHorn’s experts will provide grilling tips and guidance via phone, text message, Facebook, Twitter and Instagram. You can also visit www.expertgriller.com for recipes and grilling tips from the LongHorn Steakhouse chefs. • Facebook, Twitter, Instagram: Pose a question to LongHorn at www.Facebook.com/LongHornSteakhouse or on Twitter and Instagram using @LongHornSteaks, and LongHorn experts will answer it in real time. Add the hashtag #GetGrilling to follow the conversation and view others’ questions. If you are like me, and would rather put down your spatula this holiday weekend, the more than 460 LongHorn Steakhouse locations across the country will be open and ready to grill up the perfect steak just for you! Recently, I got to visit the LongHorn Steakhouse located at 8181 International Drive. This one is fairly close to all of your favorite Orlando attractions and a beautiful place to take a break from the hustle and bustle of the Orlando theme parks. Everything is served to you in a relaxed, warm atmosphere inspired by a rancher’s home. All the food that I tried was excellent, flavorful, and fresh. I broke my own rule and ordered seafood at a steakhouse, but this LongHorn location did not disappoint. The lobster and scallops were tender, juicy, and delicious! My dining companions really enjoyed their steaks – and all of us indulged in some of the amazing dessert offerings. It just doesn’t get much better than this! Take a look! To help you kick off your summer, Orlando Fun and Food has teamed up with LongHorn to bring you this unique giveaway until July 17, 2014. 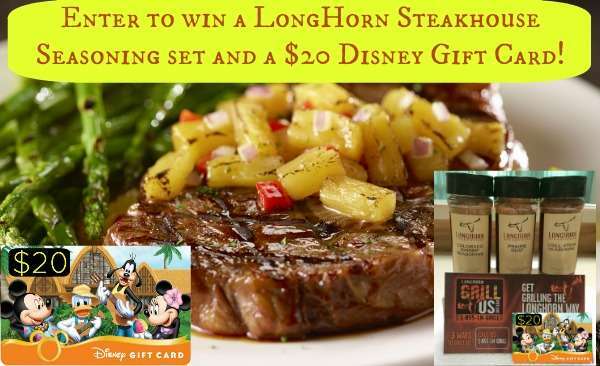 Enter below to win a $20 Disney gift card and a fantastic LongHorn Steakhouse seasoning set! Both prizes will go to one winner. We hope this will inspire you to give LongHorn Steakhouse a try the next time you are in Orlando – or just take these spices to your own back yard and #GetGrilling! Disclaimer: LongHorn Steakhouse provided me with a complimentary dinner so that I could bring you my honest review. This in no way influenced my opinions.